Progressing well” is how the French defence minister assesses negotiations to procure 128 Rafale combat aircraft for the IAF. A couple of days earlier, a German leader visiting New Delhi expressed a hope that it would be still possible for the Eurofighter to swing the $15 billion deal, even though the French product has been selected. And, as usual, the defence ministry plods along unhurried as if there is no urgency, and the air force can wait indefinitely for something needed years ago with the MiG series having long outlived their utility and the home-built Tejas yet to merit formal induction. Yet, as serious as the IAF&’s arsenal remaining unfilled is the potential for mischief that the delay provides. The British/German backers of the Eurofighter, or Typhoon, have never reconciled themselves to the Rafale getting the IAF&’s nod. Thus far they have used every opportunity to contend that their product is superior, but given the reality that no military deal is entirely above board there is nothing to prevent dirty tricks being played. It has become a “standard operation procedure” for firms losing out on lucrative contracts to spread stories of their rivals having used corrupt means to win approvals; and since almost every major Indian purchase has raised suspicions of kickbacks it would not be difficult to “sell” such a line in respect of the purchase under process. More so as elections near, and such charges are sure to resonate. It is, therefore, imperative that the bloated bureaucracy on Raisina Hill and the defence minister who admits to having ordered inquiries even on the basis of anonymous complaints shed their lethargy: if the Rafale is the best bet (no aircraft, or deal is perfect) the contractual process must be expedited. It would be a betrayal of the IAF to allow the process to linger, and then say it would make political sense to let the next government take the final call. The IAF&’s fleet of combat aircraft is thinning, and inductions come only years after a contract is finalised. Regretfully, AK Antony & Co do not understand the need for timely induction of assets. Just consider this: the aging Akbar helicopters were pressed into an unplanned final round of operations to provide relief in Uttarakhand ~ but the contract for the Chinooks to replace them has not been finalised. And to make bad things worse, a full-blown controversy is now raging over the IAF insisting on importing more basic trainers rather than await another indigenous shot in the dark. Despite frequent policy-tweaks, procurement and production of defence equipment has proved dismal, morale-destroying. There definitely has been a forward movement in the forbidding task of coping with Europe&’s economic blitz. The recent agreement concluded by the European Union finance ministers in Berlin is a striking two-pronged initiative to protect the banks and the tax-payer. The burden has been remarkably minimised in terms of the depositors; the ballooning costs will instead have to be borne by those who hold shares and bonds. It bears recall that the excessive burden on the depositors had ignited upheavals, most acutely in Greece. Since the outbreak of the financial crisis in 2008, the taxpayers have been shouldering the costs of billions of euros as part of the pump-priming to bail out what they call “system relevant banks”, whose collapse could threaten a nation&’s stability. The prescription in Berlin is doubtless a pro-people endeavour. This distinctly has been a dramatic paradigm shift and the change of stance could not have been easy before formulating a pro-people blueprint. That the negotiations were fairly tortuous is apparent from the fact that it took all of nine hours to hammer out the deal ~ the people will be called upon to contribute only to avert bankruptcy. Proportionately enough, the onus is on those who are in a position to foot the bill. The chief cause of regret must be that the agreement has been concluded after a prolonged phase of economic turmoil across the continent, notably torpid economies like Greece, Portugal, Italy, Spain and Ireland. Clearly, rational sense has prevailed within the EU and this ought logically to fructify in a banking union of the 27-member bloc. Unlike Ulfa leaders who, after their arrest/surrender in December 2009, are now engaged in talks with the Centre, the chairman of Manipur&’s dominant militant outfit United National Liberation Front, Rajkumar Meghen, popularly known as Sanayaima, faces an uncertain future. 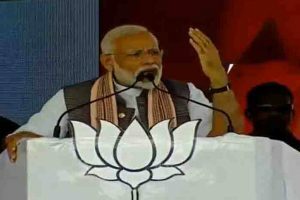 Ever since his arrest by the National Investigation Agency in Motihari in December 2010, he has been in Guwahati jail facing trial. (The agency alleged he was trying to escape to Nepal). In fact Meghen was apprehended in Dhaka in October that year but, for some mysterious reason, the Centre did not disclose his whereabouts for more than two months. The Centre&’s motive in putting him in the dock is seen as an attempt to break the UNLF&’s morale and coerce him into coming to the negotiating table. But Meghen is firm on restoration of Manipur&’s independent status and wants the state&’s future be decided by a plebiscite.